Ty Newydd01874 665797work Bed & BreakfastEnjoy the beautiful scenery of Brecon Beacons National Park from Ty Newydd, with views of the Brecon & Monmouth canal, Pen-y-fan and a colourful canal boat marina. Ty Newydd dates back to c 1750 and is bursting with country charm. Although the house has recently been extensively modernised and refurbished, it’s still retains its original character. 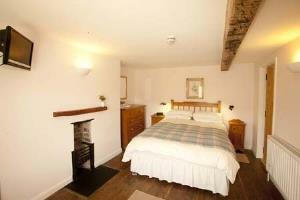 Old fire places, wooden floors and oak beams sit comfortably alongside modern bathrooms and flat screen TV’s. Guests have their own entrance to come and go as they please, a private breakfast room and a conservatory to relax in. All four bedrooms are en-suite, spacious and have panoramic views of the lush Welsh countryside. The traditional cooked breakfast is sourced locally when possible – fresh farm eggs, thick Welsh back bacon, and handmade meaty sausages. Ty Newydd is the ideal base to enjoy a relaxing or active break. Although secluded, we are conveniently located 3 ½ miles from Brecon off the A40 and a 10 minute walk from the pretty village of Llanfrynach. There are a number of good pubs and eateries either within a walking distance or few miles, catering for all budgets and tastes. The Brecon Beacons with its miles of beautiful public path ways offers walks for all abilities. The Monmouth and Brecon canal tow-path can be accessed literally from our doorstep. Pen-y-fan, the highest peak in South Wales and Llangorse Lake, one of the few eutrophic lakes in Wales are both close by. The Mountain Centre and the activity centre at Llangorse Lake offer a wide range of other challenging outdoor pursuits. For a taste of South Wales industrial Heritage visit Blaenavon, World Heritage site and The Big Pit Mining Museum or take a ride on the Mountain Railway from Pant. Other popular days out, include Hay-on-Wye world - famous for its second hand bookshops or the show caves at Dan-y-Ogof, one of Britain’s finest natural wonders.